I wrote a piece earlier on in the year about neck and shoulder issues and my journey in dealing with neck and shoulder pain. The piece outlined how I was revising my playing position, technique and looking at exercises…..Well, guess what folks. The neck and shoulder gremlins have returned. The little buggers! I know it’s an issue that affects guitarists in all parts of the spectrum – beginners through to pros and everyone in between, so I thought I’d write a little piece on this today. You may have experienced or are experiencing something similar, and so in writing this I hope I can help in some way or start a bit of a discussion. This will also start a series of blog posts about treating and ultimately preventing soreness and overuse injuries of this nature. So what’s the dealio? What’s going on? Well, the pain and soreness in my right (and only my right) shoulder back and front (or posterior and anterior, if you want to get all anatomical and stuff) and the right side of my neck has been really building up again over the past couple of weeks. And naughty me for not paying attention to the first little warning signs and nipping it in the bud then. Smack hands! Serious amounts of clicking, particularly across the front of the shoulder joint, where apparently there are some very tight bands of muscle catching and popping across the clavicle (collarbone) – nice. A continuous dull aching sensation in both the front and back of the shoulder joint, leading me to want to punch myself in the shoulder to relieve it! A dull aching sensation sometimes travelling up into the back of my head, jaw and eye and down into my upper arm. Sharp pain in right shoulder-blade, especially when turning my head to the right. 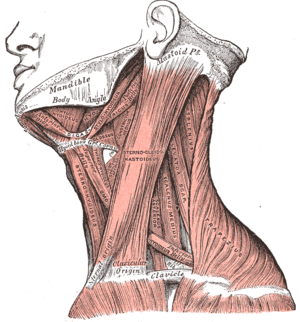 Tightness in right side of my neck – a real pain in the neck. Boom boom! As you can tell from the delightful mix of symptoms it’s not really all that pleasant and can become quite restrictive in terms of playing – very annoying. Ouch! How does that happen? Me being very naughty and lazy and not giving mindful due care and attention to my posture whilst playing. Not being fully mindful and observant of the little twitches, ticks, reflexes and other seemingly involuntary and often unnecessary movements one makes when practicing and playing. For example, does raising ones toes off the ground and hunching ones shoulders really help you in playing that pianissimo line up of the tenth fret? I’ll let you answer that one….. Possibly some physical weakness in the back and shoulders that I can address with some strengthening exercises. Overworked, tired and stressed shoulder, neck and back muscles from too much of one activity without an opposing kind of activity to balance things out. So what’s next then? How do we go about remedying the situation? l cracked it this week, and got really fed up of the constant dull aching sensation and sore neck and decided to I needed to get some immediate physical relief. Time to get it sorted out properly. Not in the form of painkillers; I don’t really like to take them unless I really have to because they can mask what your body is trying to tell you. So in this instance I’m sucking it up and listening in carefully to the messages my body has been yelling at me for a while. Immediate physical relief in the form of massage. And not just any massage. Awesomely seriously targeted and condition specific Myotherapy manual manipulation and a bit of dry needling to boot. Myotherapists are experts in this kind of myofasical pain, its treatment and prevention. My lovely therapist’s diagnosis transliterated into my layperson’s terms is that my neck, shoulder and upper back muscles are really overworked, constantly “switched on” over stretched in one direction and super fatigued. As a result they’re not working properly, they’re all bunched up. To add insult to the injury this bunching also results in the reduction of blood flow to the area meaning the waste products generated by the constantly “switched on” muscles is not being flushed away which adds to the pain, tenderness and tendency to spasm. The myotherapist tells me that the poor afflicted muscles are the levator scapula, sternocleidomastoid (or SCM for short), the upper trapezius, supraspinatus, and infraspinatus. My neck, shoulder and upper back muscles basically need releasing from the prison I’ve trapped them in, they need a good stretch and strengthening up. After the myo session the next 12 hours or so I felt like been beaten up (which I kind of had! ), but that seriously frustrating dull ache and pinching sensation in the back of the shoulder-blade were gone. Wooo! Still a bit of work to do though, as the ol’ chicken wing is still feeling a bit unstable, a bit tight, as is the neck. I have another myotherapy appointment early next week, so I’ll you posted about the next step in my treatment and the strengthening exercises the myotherapy proposes I do. To remedy the point about it doing enough stretching, I’m going to try some yoga classes in this first instance (going to give Bikram or hot yoga a whirl) and then follow that later in the year with some Alexander Technique lessons. I’m getting onto the yoga this very weekend so I’ll let you know how that goes. In terms of my technique, over this next few days I’m going to set the movements radar to high alert. I’m also aiming to observe in greater detail all the movements I make whist playing. I’ll also be doing some stretches and range of motion exercises before and after playing (which I’ll outline for you in a future blog post). * I’m not actually sure there’s a condition called Guitarist’s Shoulder, like Tennis Elbow or Policeman’s Foot (I shall do some research around that and follow-up…. ), but that’s what I’m going to call it for now. I have the same neck and shoulder pain on my right side too . I am left handed though . how r you feeling now ? what helped ? thanks for your message. Sorry to hear that you’re experiencing some pain. I have serious shoulder pain where I cannot raise my elbow hardly at all without severe pain. My pain is in my left shoulder and upper left arm and I am a right-handed guitarist. I’ve been playing a large, heavy jumbo 12-string for 40 years. X-rays show nothing. I think it might be time for physical therapy?! Yes, definitely time for some kind of medical intervention I’d say! Perhaps also worth having a teacher or another guitarist to look at your technique and perhaps help you find and release that tension whilst playing. Good luck! OOH i’ll have to check out myotherapy – I’ve been a huge fan of osteopathy for years but this sounds good too. FYI I’ve taught singing for 23 years and am a classical singer who’s now performing pop songs – playing guitar more than previously….and my shoulders are about to fall off. One thing that’s been saving me is the application of my voice technique to guitar playing – the more you stand in one place/keep still/do the same thing for hours and hours the worse you’re going to feel. Keeping yourself still involves muscles as well, which get fatigued and stiff and will affect your musicianship in the long run. So move, move, move! Only stay still if you have to. The added benefit is that it’s more visually interesting to your audience. Have you tried some Alexander Technique too? I’ve found that particularly helpful in the last 6-9months or so.